It is time for us to all start seriously thinking about election day…to embrace our patriotic duty by diligently watching the debates, researching, and casting our votes for the best candidate to lead this great country. That being said, I almost feel guilty voting for Mr. Obama – he inherited quite a mess when he took office and I’m sure he is beyond exhausted by now. Besides, I’m betting his resume doesn’t read like Barbie’s. Has Barak held employment as an airline pilot? Or a veterinarian, nurse, teacher, artist, life guard, dentist, astronaut, paratrooper, Officer for all branches of our military, spanish teacher, and paleontologist to just name a few. Nascar Barbie – In your face, Romney! “PETA is not happy that my dog likes fresh air.” —Mitt Romney in 2007, responding to criticism from People for the Ethical Treatment of Animals following revelations that he had once put the family dog in a carrier and strapped it to the roof of his car during a 12-hour road trip. What ? I mean… what? Theres good news – we have a third choice ! 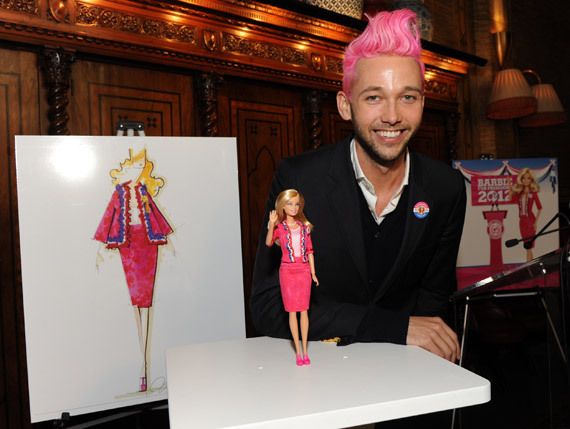 Armed with a new pink power suit by designer Chris Benz, Barbie is embarking on her 5th bid for the presidency…. Hm, we didn’t see designers dying their hair pink & lining up to dress Sarah Palin…. Her affiliation? The B Party. I’m wondering what hue of pink will take over the Oval Office…. Her quotes would have to be better than Mitt’s. Seriously. Im sure Brbie would have lots to say !!! I realize it must be difficult to be in the public eye, but when you KNOW youre in the spot light….. maybe Mitt needs someone to stand to the side & give a signal when its time to shut up ! That Barbie looks exactly like Reese Witherspoon in Legally Blonde 2! It does, right down to the suit – the first LB movie is one of my favs ! I’d vote for her too…. Michigan is a bea-ute, ya der heh? No, but I’m from there, and I miss it! And everything is so relaxed there as opposed to NY… Yeah, the first movie was awesome. The second was just okay, like so many sequels… I’m excited to someday watch that movie with my daughter though! I remember watching movies with my parents that they had seen as teenagers, and it was funny to see them years later. Love & Lunchmeat – I echo your first sentiments! Is Reese Witherspoon really the one trying to run for presidency here with some subtle subliminal messaging? Well, if we cant be the scary big world power anymore, maybe we need to settle for cute ! I dont think I’ve seen Drop Dead Gorgeous, will have to check it out ….. If Mitt’s first name is WIllard, why doesn’t he use “Ben” as his campaign song? I think this would work on many levels. Willard was a movie about a strange young man and his friends and his friends just happened to be rats and Ben was his most favorite rat friend and the song was by Michael Jackson who is no longer with us except in song so he can’t lodge any protests over Mitt co-opting a song without express permission to use a song to illustrate how lots of his friends are rats or captains of industry, though I’m not often sure what the difference is. Just think of what Barbie could get done?! After all…she doesn’t need a man (Ken is not a real man), she knows all the top designers in the world and so many want to be like her…think of all those “House Wives of” chicks! oh yeh, we’d at least be the “cool” country again – we’ve kinda lost that now with princess Kate ! Oh, my. Trees the right size? Are there specifications? Do I need to measure mine? Will the parks service confiscate wrong sized trees…they’d better give back some right size trees – Wait is there some sort of mandate about trees that could explain the wild fires in Colorado and New Mexico? Oh, dear. Better get Barbie on the phone – she’s probably been a National Park Ranger or the like sometime….Is she still denying there’s been some plastic surgery done? Well, it doesn’t matter. She’s a doll. Might have a chance in the oval office. Plastic surgery, She’s a doll… I so enjoy your quips !!!! !